National Geographic Walking Guides is a series of books presenting carefully curated itineraries showcasing beautiful sights in the world’s most popular travel destinations. They are written by expert travel writes with thorough knowledge of the destination. The books are illustrated with beautiful imagery, for which National Geographic is world-famous. 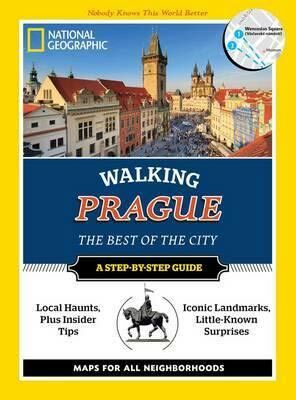 Walking Prague contains 12 itineraries and maps which will help you discover amazing places in the Golden City. Each tour is plotted on a map to help you navigate through the maze of old streets and lanes like a local. Whirlwind Tours: for all tourists who have only a day or a weekend and would like to see the best of Prague. The tours can be chosen based on your time and interests. Neighborhood Tours: for all those who have a little more time and would like to explore Prague’s finest neighborhoods more thoroughly: the Old Town (Staré Město), Josefov, the Lesser Town (Malá Strana), Hradčany, the New Town (Nové Město), Holešovice. The final chapter of the book contains travel essentials and a brief language guide. The book’s author has lived in the Czech capital city for two decades. He has written or edited more than a dozen guides to Prague.